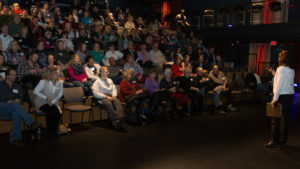 We held a work in progress screening at the Hanesbrands Theatre here in Winston-Salem on January 5th. Over 160 people attended. Among them were some folks from the press. Brian Clarey from Twin City Beat, who had written about Greg before, wrote the cover article for his paper: Greg Taylor and the long arc of justice. You can read it here. We also got coverage in the Winston Salem Journal’s Scene and Heard column by Cindy Hodnett. And just this week the Winston-Salem Chronicle published this article! You guys are really rocking the world of justice reform. So proud of you and the work you are doing.